U2's Bono sat down for a cup of tea and a chat with Russian president Dmitry Medvedev on Tuesday to discuss charity. The president hosted the rocker at his house near the Black Sea resort of Sochi to talk about HIV/AIDS, poverty and Africa. 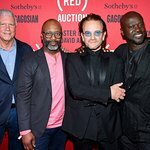 Bono took the opportunity to encourage Russian companies to join his Product (RED) charity campaign, and told the president that it only takes 40 cents per day to eliminate the transfer of HIV from mother to child by 2015. He also explained his thoughts on government corruption, and how it can actually be used to help end poverty. 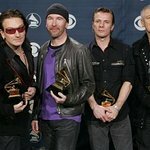 The chat took place prior to U2’s first ever concert in Russia, and also saw the two men discuss their tastes in music.